Buttermilk pancakes are a treat. Some people prefer them to traditional Flapjacks. Buttermilk is not available in Sweden but is in Denmark. You can substitute lättfilmjölk for buttermilk for a decent result. Buttermilk Pancakes Buttermilk is not available in Sweden but is in Denmark. You can substitute lättfilmjölk for buttermilk for a decent result. Buttermilk pancakes are a treat. Some people prefer them to traditional Flapjacks. Sift the flour, sugar, salt bicarbonate and baking powder in a bowl. Add the egg and melted butter and the buttermilk a little at a time. See notes below. Do not stir the batter too much you only want to get it smooth. A few little lumps won't really effect the cooked pancakes. Big ones will! Cook the pancakes by heating a heavy cast iron skillet (frying pan). until hot. Put in a little butter (1 tsk - 1 teas) and let melt. Then with a soup ladle or large spoon, drop some of the batter into the hot pan to make a disk 12cm (5 inch). Let cook 2 to 3 minutes until bubbles begin to rise to the top and the pancake begins to get a dry, cooked look around the outer 1/3 of the pancake. The bubbles should just be ready to pop. Turn the pancake over and cook for 1 minute more. You can tell when the pancake is cooked by it's weight. It should be nice and light. 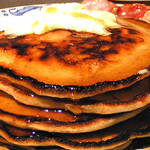 Serve 3 to 4 pancakes per person with bacon, 2 fried eggs and lots of softened butter and even more wonderful Maple syrup. Buttermilk pancakes are preferred by my many people in the States. 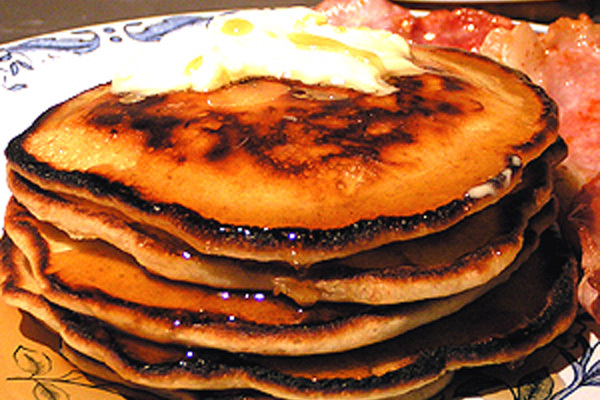 In America pancakes are the national breakfast dish and there are lots of ways of making them. I really put up this recipe because I am so sick and tired of crappy European TV chefs coming up with ridiculous and down right stupid recipes. It's no wonder you can't find decent pancakes for breakfast here. About the batter: The batter should be on the thick side (not runny) in order for the pancakes to puff up and be light and you should try and rest it for 20 minutes but not longer than 2 hours. The measurements for the milk; flour absorbs liquids differently depending on the humidity in the air and how it is stored. Remember these are not crepes or Swedish style pancakes the batter is much thicker. By the time you have tried this recipe 2 or three times you will see exactly how the batter should look. If the batter is too thick it can be thinned with a little more buttermilk or plain milk or thickened with a little more flour. Fruit pancakes: You can do this with buttermilk pancakes the same as with regular pancakes. Soft fruit like raspberries or blueberries can be added to the batter whole. To this recipe you can add a big handful of blueberries even sliced or halved fresh strawberries. Why not whole wild strawberries? We don't really have them in the Northeast where I come from but I think they would make a great addition. Bananas or larger firm fruits can be sliced thin and pushed into each pancake as you make them. They will not become completely submerged in the batter no matter how much you try so don't bother. You want to get it down so the top of the sliced fruit is a millimeter below the height of the batter. I have seen a lot of things put into pancakes but I prefer the more traditional additions. Frying the pancakes: Pancakes are best cooked in a heavy cast iron skillet (frying pan). To save time use a large frying pan where you can get 2 or 3 pancakes in at a time. Heat the pan hot - not smoking - but very hot. You can test the pan by making a little mini pancake to see how it cooks and colors. You will need a little bit of butter in the pan for frying the pancakes. You can wipe the inside of a pan with a paper towel with some softened butter on it. If you do after each pancake or batch of pancakes wipe the pan out with some paper towel, the butter will burn and you want to remove it after the each pancake or batch are cooked. Continue this process until all the pancakes are cooked. Storing cooked pancakes: Pancakes are best just out of the pan but this is a bit difficult when you are making for the family. Heat your oven to 50°C or (100°F) and lay cooked pancakes on a kitchen towel placed on a baking tray or cookie sheet, not overlapping to stay warm. Because they are hot and will produce steam and wrapping them or stacking them will make them soft and spongy. I have frozen unused pancakes but I have to say that they were in honesty pretty terrible. Maple syrup is Maple syrup and nothing is quite the same. It is readily available here in Sweden for a price! I remember being young and my aunt cooking liters and liters of maple sap they collected in the woods of Pennsylvania where they lived. It takes approximately 40 liters of sap to make one lit re of Maple syrup, and a mature sugar maple tree produces about 40 liters (10 gallons) of sap during the 4-6 week sugaring season. 75% of the worlds Maple syrup comes from Canada with some of the balance coming from the northeastern states of America (Vermont & Maine). It's here that the purists die! There are only 2 Maple syrup substitutes which are worth bothering with "Log Cabin" and "Mississippi Bell" neither of these have more than 2% Maple syrup (if any at all) in them but they come the closest to tasting like Maple syrup. They are technically called "maple flavored syrups". I have found both of them at Grey's American Food in Stockholm but I have also seen them at the really big ICA Maxi stores. About Pancakes in general: "Pancakes", "Flapjacks", and "Griddle Cakes" are all the same thing in America. Johnny Cakes are made with stone ground corn meal, and Buckweat Cakes are of course made with a combination of plain flour and buckweat flour (bovete).The size of pancakes is really up to you but they average from 5cm to 8cm at most. "Silver Dollar" pancakes are the same except they are the size of a silver dollar about 3 cm across. Kids love these and they were a treat when my mom used to make them for us. In Sweden we have Plätter which are eaten with much relish for dessert but they are made from a different recipe and are a bit thinner and lighter than American pancakes. Making small pancakes 2 to 3 cm across can also be a good vehicle for snacks and canapes, cover them with a little Philadelphia cream cheese and some jam, salmon or anything you would like.